Designing FIRST pneumatic system layouts and choosing cylinders. One way for the driver to adjust pressure on-the-fly remotely. Push-to-connect and brass fittings, as well as tubing belongs at every level. Must be powered by robot, so a quick electrical connector is included. 12v vs. 24v solenoids - SYMPTOM: one solenoid works but another does not. The Pneumatics Control Module (PCM) can handle either all 12v solenoids or all 24v solenoids. 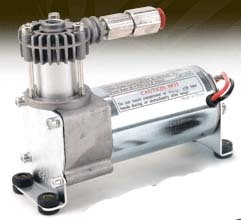 24v solenoids have the advantage of being boosted and will work down to a low voltage. 12v are not boosted and follow the current battery voltage, so hen the battery dips, 12v solenoids may operate erratically. 12v solenoids have the additional benefit that they can be used with Spike relays should you need a few more. It's a good idea though to settle on all of one type (12v or 24v) or the other to avoid adding to your maintenance and replacement problems. 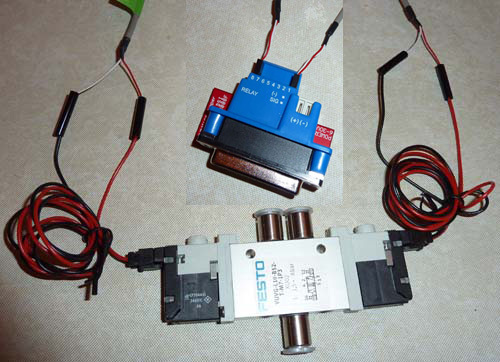 Be careful not to confuse 12v w/ 24v solenoids and inadvertently mix them on a single PCM. The solenoid is labeled 12v or 24v, and the PCM has a jumper that can be set to have the PCM drive either 12v or 24v, not both. One PCM is able to handle a maximum of 4 double solenoids and/or up to 8 single solenoids. Basic Hw/SW Troubleshooting -- SYMPTOM: Solenoids/Compressor just don't work. Start at the top of the control system and test your way downstream. First, check the obvious status indicators - The Driver Station statuses-all of them, the Robot Signal Light (RSL) on the roboRIO. Nothing works if the control system isn't Enabled. Next, verify the code is working. Before the solenoids or even the PCM or Spikes come into the picture, there are status LEDs on the PCM that will indicate if the code is working correctly. If none of these status LEDs are lighting, then your problem is upstream from there (code, PCM connections, or a bad status on the DS or other component), not downstream (solenoid). Correct functionality can be checked using known working code, e.g., the LabVIEW "Solenoid Example." It's of critical importance to not make any changes to known working code. There is no need to have a solenoid or even the PCM board mounted for this test. Enable the Driver Station, and just click on the solenoid button on the front panel. If the first LED in the bank of 8 on the PCM lights, then it works properly and your code has a bug. 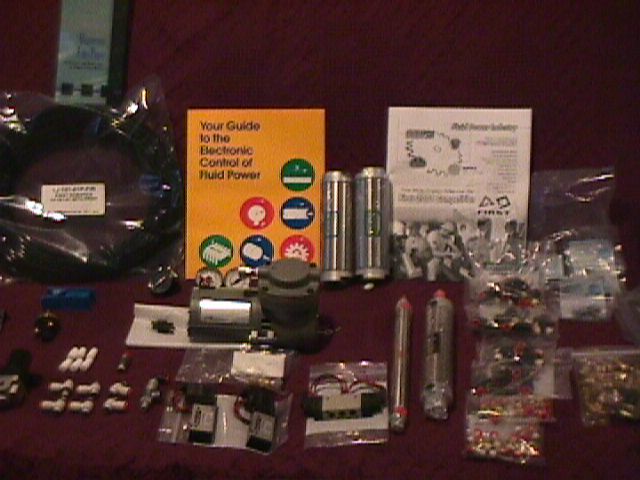 Third, check the wiring and connections to the PCM, the PDP, the solenoid. If you get all the way downstream, then begin to swap out parts one at a time, such as the solenoid with another one or a different type. Reversing the regulator flow -- SYMPTOM: system pressure won't go above ~60 psi and the compressor keeps running. The regulators have a flow direction arrow stamped on them. The arrow points to the low-pressure output port. The opposite end or tail of the arrow is the only port that high pressure air comes in. All other ports are restricted by the regulator (one usually gets a pressure gauge). Incorrect tubing of the valve -- SYMPTOMS: Air escapes continuously and prevents the system from pressurizing, the cylinder won't move when the manual override button(s) on the solenoid is pushed (no power is required for the manual overrides to work, just air pressure). Check the assembly instructions for what each of the ports does. The solenoid ports are either lettered or numbered. There will be one port for pressurized air to enter, one or two ports for air to escape (leave these unblocked without any tubing connected), one port to control one end of the cylinder, and another port to the opposite end of the cylinder. Incorrect valve wiring -- SYMPTOM: PCM solenoid indicators light up, but the valve never moves, or it only moves to one position and never returns, or the value lights don't light. Possibly one of the mechanical triggers may be locked (usually blue buttons with a screw slot, located at each end of the solenoid). Usually the screw slot should be oriented along the length of the solenoid. You can push these blue buttons to mechanically test the solenoid, too. Just don't push & twist hich locks them down. 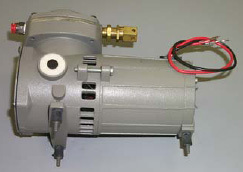 Single solenoids have a "home" position when the power is turned off, when the control cable is not connected properly to the PCM, when the robot is in "disabled" mode, and when ordered to by the code. Double solenoids do not have a home position and will stay wherever they were last ordered to be, power or no power. The roboRIO programming differs based on what you use (LabVIEW, C++, Java), so consult the appropriate programming manual for "Solenoid." Leaky connections -- SYMPTOM: After the system pressurizes the gauge shows the air pressure dropping and the compressor cycles on and off. EVERY single brass thread fitting must be wrapped with the teflon tape that comes in the Kit-Of-Parts(KOP). Each tubing end must be cut as perfectly square as humanly possible. Each tube must be pushed all the way in to each fitting. Intermittent Radio Communication -- SYMPTOM: Single solenoid values fire briefly on their own. Single solenoid valves have a home position that it returns to whenever communication is dropped, the robot is disabled, or power is cut off. There is nothing wrong with your pneumatics. It's just an indication that something is wrong with your radio (bad/loose radio cables/radios, two robots on the same radio channel, two robots with the same team number, etc.). Compressor Won't Run -- SYMPTOM: The compressor was working, but stopped and won't start. 1)Check the PCM connection for the compressor. 2)Check the pressure sensor connections. There is only one high pressure circuit, but there can be many lower working-pressure circuits. You do not have to have a tube/solenoid connected to both ends of a cylinder. One end can remain untubed, open to the atmosphere so air just comes and goes. This is typically done when gravity is used to return a cylinder to it's starting position, and air pressurizes only one end of the cylinder to thrust. This is often used to preserve your limited pressurized air supply and make it last longer. Try to use the plastic fittings rather than the brass fittings to save robot weight, e.g., the high pressure gauge, and the pressure switch can both be connected to ends of accumulator tanks rather than to brass fittings. 60 psi is the highest working pressure we are allowed to use, however, air can be saved by using lower pressure wherever possible. For instance, opening a gripper doesn't require a lot of force, so it could be done with 30psi, while grabbing something might need 60psi. You'll save half the air opening your gripper. Use a double solenoid when you want your actuator to remain in the position you last put it even if your robot is disabled or turned off. 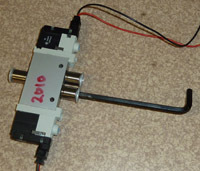 Use a single solenoid when you want your actuator to return to a home position whenever the robot is disabled, momentarily drops communication, or the power is cut. The Festo single solenoid valves are faster and have a greater air flow, but require a higher minimum pressure (30psi) to operate. The SMC valves will operate with a lower (20psi) minimum pressure and the lesser air flow is unnoticeable for most uses. Use SHORT runs of tubing between the solenoid valves and the pistons, as short as possible. They must be compressed along with the piston and just add extra empty volume. Long runs of tubing are advantageous BEFORE the valve and before the regulators where they act as extra reservoirs of compressed air. 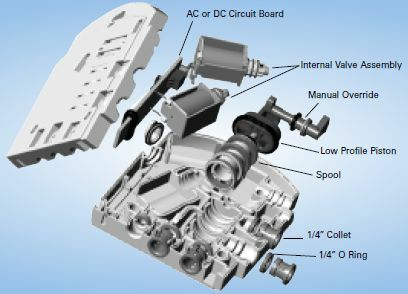 Both single and double solenoids perform the same actions and have the same number of available ports. Why we choose one over the other has to do with how their behavior differs. A single solenoid has a spring return to a home position. It is energized to move it to the opposite position and will automatically return to it's home position when the energy is taken away. One advantage is that it only takes up one PCM output, so you can have 8 single solenoids on one PCM and therefore control twice as many cylinders as an equivalent Breakout full of double solenoids. An advantage might be that, went the robot is Disabled, the solenoid will return to it's home position, e.g., your robot just made it to the bar and hooked on, but the match ended before you could pull up, if you set the home position right it will still retract upon being Disabled and get you that 10 pts for hanging. A possible advantage is that the robot automatically returns to it's starting configuration, so no hooking up after the match before it fits back on the cart. A disadvantage might be that same home position when Disabled. Instead of stopping the robot cold when Disabled it may unexpectedly shift positions. E.g., if you're holding an arm up in the air with a cylinder, and someone (me) goes to look at something under the arm and a helpful person quickly Disables the robot for safety, then the home position could bring the arm snapping down onto said person's head (me). A double solenoid does not have a home position. It stays in whatever position it was last ordered to. An advantage is it does not have to be kept energized once the move has been completed, although the energy savings is miniscule. An advantage is that remaining in position is generally safer when the robot becomes Disabled unexpectedly. On the other hand we should Disable the robot before we get close to it anyway. A disadvantage is it takes up two PCM outputs for the same functionality as a single, so only 4 fit and can be controlled by a Breakout. An advantage is that doubles have been donated for free to the KOP for a couple of years, and free is good. A good pneumatic system will hold air seemingly indefinitely. Certainly handy for pre-charging the system before you put your robot out on the field and wait through long introductions. If your system won't hold air for ten minutes then here are some suggestions on eliminating leaks. At one time or another I've seen just about every possible part arrive with a manufacturing flaw: regulators, pressure release valves, solenoids, pressure sensor, damaged actuators, damaged fittings. It helps to assemble your pneumatics system outside the robot first making it easier to locate leaking sections. It does help to have a supply you can swap out suspect parts with (older robots end up with any leaky parts). Isolate the pneumatics system a section at a time working from upstream to downstream and eliminate all leaks in each section before moving on. Just temporarily dead-end the tubing with a plugged brass fitting or a loopback T-fitting. Sometimes new valves wont work unless you manually cycle them a couple times first. Sometimes KOP SMC valves arrived with 24v coils that are now (starting in 2010) legal, check out the printing on the valve to see if they are 12v or 24v. It is possible to over-torque the mounting screws of the plastic Festo valves and distorted the plastic case, causing the pilot to bind, or the case to leak. Bypassing the air reserve tanks and the 120 psi gauge will drop very quickly making any sort of leak easy to spot. Leave the complete system at full pressure for thirty minutes with air cylinders both extended and then retracted to try to catch leaks. The walls of these cylinders, although steel, are very thin and will dent easily. Once dented they are ruined, because the piston rod seal inside is a very tight fit, and it will catch, slow or jam on the slightest bump. These pistons are also not designed for side loads, so push/pull only in-line with the piston travel. Do not design your mechanism to shove against the side of the piston. The latest pneumatics manual always has the most up-to-date information, however, there are nice tidbits to be found in the older manuals, too. It's interesting if you're into history and useful for identifying some of those old pneumatic parts that are lying around your shop from years before you joined the team. Kv (metric) The flow rate in cubic meters per hour [m3/h] with a 1 bar pressure drop across a device. NPT National Pipe Taper specifies the size threading on screw fittings such as those that screw into the cylinders of solenoid valves. Ports are rated based on the inner diameter of the fitting inserted into this taper, not the thread size. That makes it hard to directly measure the internal port size. Actuator or Cylinder a device that produces mechanical motion. Usually, a cylinder has a piston or rotary mechanism that air pressure shoves against. Storage Tank a hollow container to hold a reserve of compressed air. Solenoid an electric valve under software control that changes where compressed air is routed to actuate a cylinder. 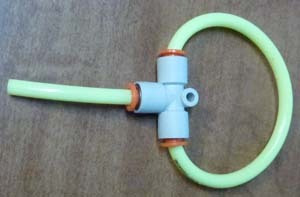 Tubing plastic hose rated to carry pressurized air from device to device. 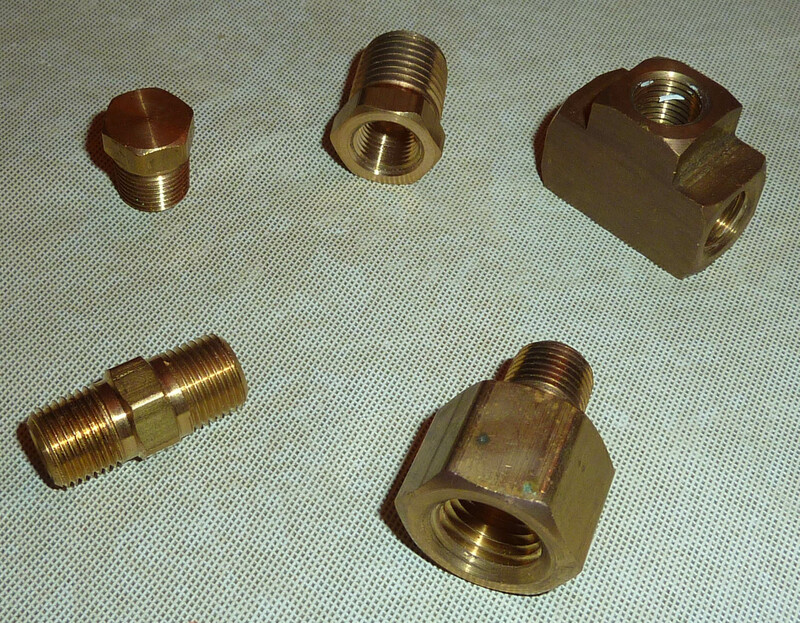 Fitting brass or plastic connectors between tubing to devices or devices to devices. Gauges meters that show the air pressure at one point in the pneumatic system. 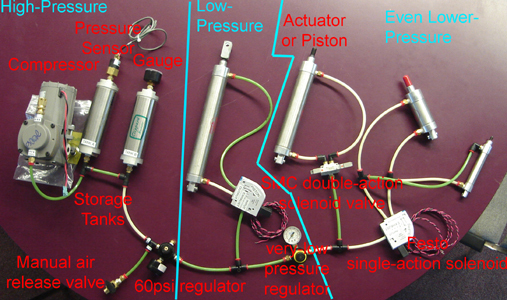 Regulators devices that regulate the pressure of compressed air. 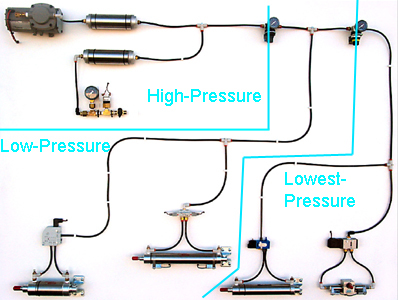 These are used to divide pneumatic systems into zones of different compression levels. Pressure Switch a switch that only turns on and off at preset air pressures and signal software. Pressure Transducer a device that tells software what the exact pressure is at all times. More sophisticated than a pressure switch. Dump Valve a manual valve used to quickly release all the compressed air in a system. Compressor a motorized pump to compress air. Pressure Relief Valve an automatic safety device that releases air if the pressure of a pneumatic system climbs too high. Benefit: a good flow of air, Drawbacks: much more expensive than the ViAir below and is both heavier and larger. Useful information on overall measurements, how fast it compresses air, how many amps it draws. 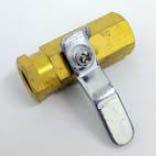 This is required on the high pressure side and is an automatic safety release if the pressure builds up above 125psi. It is adjustable, and must be calibrated. First, jumper to bypass the pressure switch so the compressor runs continuously. Second, loosen the locknut on the relief valve, then when the pressure starts to pass 125psi, rotate the knurled cap until air escapes and the pressure remains at 125psi. finger tighten the locknut, dump the air and let the compressor run the pressure up again. If it doesn't stabilize between 125-130psi, readjust the knurled cap again. When you are satisfied tighten the locknut securely and un-jumper the bypass of the pressure switch. This is a switch that installs on the high-pressure side and turns on if pressure drops below ~95psi and turns off if pressure rises to ~115psi. Measures exact psi in the system and lets your code make decisions based on that. Not a Kit item, but useful if you want to be sure of having sufficient pressure before triggering a cylinder. 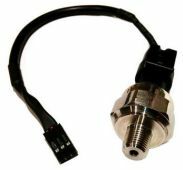 This sensor returns a voltage proportional to the current system pressure and installs on the robot pneumatic system on either the low or high pressure side. Look for 5v analog versions for simplest interfacing with the roboRIO system with a 0 to 5v output. 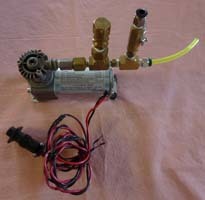 This is used anywhere on the high pressure side to monitor the pressure and the automatic start/stop of the compressor. Another one of these is used with each pressure regulator in the system (see examples following). This one is used to reduce the high-pressure (120psi) to working pressure (60 to 30 psi). Adjust the knob on the bottom clockwise to increase and counterclockwise to decrease outlet pressure setting. When reducing pressure, first reduce to a pressure below that desired, manually venting excess pressure and closing it off, then increase until you reach the desired outlet pressure. There is a locking collar to tighten and freeze the knob at the setting you want. An arrow shows the proper direction of air flow and high-pressure must be attached to the tail of the arrow. 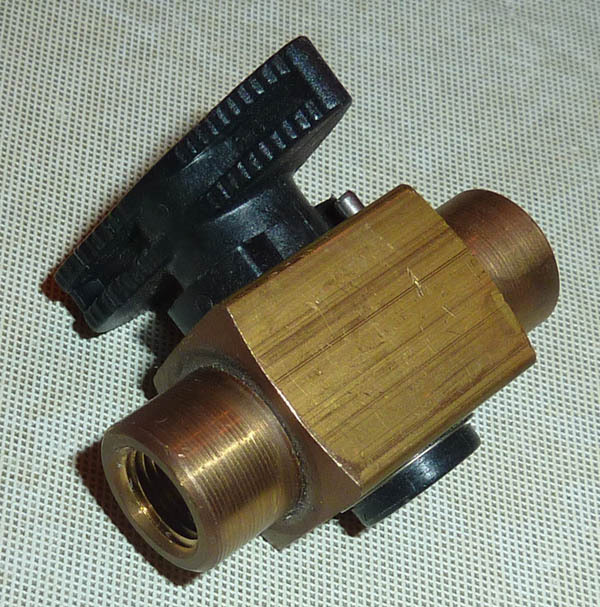 The other three fittings are low-pressure outputs: one gets a pressure gauge, and the other two can be used for tubing or can be blocked off with a plug. Remember to Teflon tape each of these fittings. Used between the first working-pressure level and any optional lower-pressure levels you may desire. Note: This MUST be driven by 24v. This only works by using the PCM jumper set to 24v. The fittings MUST be tightened using a #4 metric allen key down the center of the fitting. SMC Solenoid Valves came in past years kits (12v versions) and are commonly available for purchase. This gives the nomenclature for the valve part number, the flow rate, the response time (Single is 15ms or less, Double is 13ms or less), and options (check FIRST rules). SY5000 series is disallowed by some game rules due to high air flow. VexPro Solenoid Manifolds are commonly used and available for purchase in a number of sizes. 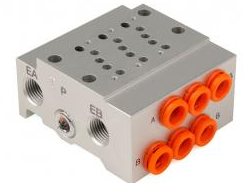 These mount a number of solenoid valves on a common base manifold that groups the ports all in one place. Note: On some of these special order valves the wiring does not follow the standard directions (use terminals 1 & 2). If your valve doesn't work when power is applied, then switch your positive wire from terminal 2 to terminal 3 (use terminals 1 & 3). This is a Venturi device. It works with a steady tiny, low-volume flow of compressed air whenever a vacuum is needed. PIAB P2010 Vacuum Pump Specs. Push-to-Connect fittings - in past kits, this may now be available as a choice from the online kit (FIRST Choice). Not normally something you'd want to use, since a solid hose is not prone to air leaks, but handy if you need to extend tubing quickly. For instance, to borrow compressed air from your robot for other purposes, e.g., inflate a ball, blow air over a work area. One end screws into a cylinder/storage tank/regulator/etc. opening and the other takes the 1/4" tubing. The screw fittings required differ based on the size hole in your cylinder/storage tank/regulator/etc., for example, the Clippard storage tank has a 1/4" NPT port, while a typical actuator might use 1/8", and a Bimba rotary actuator requires a tiny connector. These fittings will slow down the extension and/or retraction of a cylinder, so it isn't always slamming home. A few variations available here, e.g., you might want to meter the flow into an cylinder vs. out of an cylinder. Use tubing that is marked with a pressure rating to make it easy on Robot Inspectors. Plenty of tubing comes in the Kit. These are used to mount the Thomas air compressor to reduce the vibrations inflicted on the rest of the robot. They are just a bit of rubber with two tiny bolts on either end. These usually come in the Kit, but extras are often purchased to increase compressed air storage capacity on the robot. Several different sizes are available. These are just a couple of them. An alternative storage tank that's lighter, but must be purchased. This is used to release all pressurized air from the system and is installed on the high pressure side. Your system must be setup so that when this dump valve is used ALL compressed air is released and NONE remains locked inside cylinders or elsewhere. Teams receive more of these than they can ever use, so if you've lost yours just approach a nearby team and they'll probably have whatever you need. There are aluminum versions of these available from McMaster-Carr and other pneumatic suppliers. They are heavy, so it is worth designing your pneumatic system to eliminate almost all use of brass fittings. Systems are regularly put together that do not use a single brass fitting (thereby contributing to the overabundance of surplus brass fittings that all teams seem to have). Note: Teflon tape must be used on all screw fittings. Cylinders do all the work in the pneumatic system. 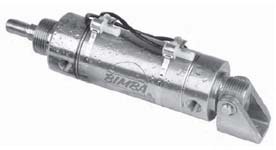 3 free cylinders are offered by Bimba each year. You can buy more on your own, too. They come in a variety of strokes (length) and bores (how big around) and have optional reed switches that can tell your control system when they are open or closed. If reed switches are desired they MUST be part of the cylinder order, the cylinder has to have a special magnet assembled inside that trips the reed switches. 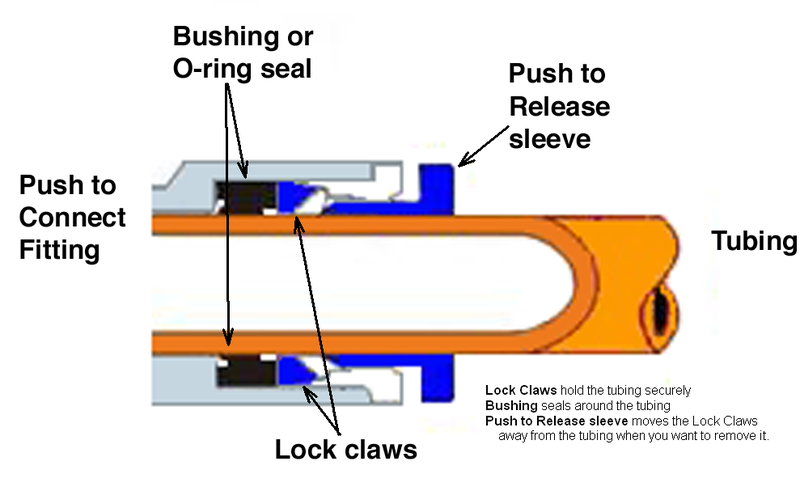 These include pivots for the cylinder base, so it can move freely, and a clevis that screws onto the piston/rod end and makes it easy to attach things to the business end of the cylinder, Reed switches for detecting when the piston is in a particular position (the switches can be placed anywhere along the length of the cylinder). Use fresh teflon tape (it comes in the Kit) on all screw fittings to prevent air leaks. It's the only way to make the fittings leak proof. Do not tape the first two threads to avoid the chance of bits of tape breaking off inside and potentially catching and clogging the solenoid valves or regulators. If you remove a screw fitting, then the tape on it should be removed and replaced with fresh tape to insure that it seals properly against air leaks.